Most people who profess to be Christians…that is, members of most Christian denominations…reject the notion that any and all religions lead a person to God and to Heaven. And, people should reject this notion because it is a lie of the devil. And yet, within the realm of Christianity, people have perverted, subverted, or misconstrued what God has given us in the King James Bible and created a large number of “Christian denominations”…each with its own set of emphasized doctrines. Many of these “Christian denominations” differ so much that they effectively are different religions. And, just as all religions do not lead to God and to Heaven, neither do all “Christian denominations” lead to God and to Heaven! In Matthew chapter 7, we can read that on Judgment Day, Jesus will be telling MANY people who called themselves “Christians” that He does not know them and that they are in fact workers of iniquity. 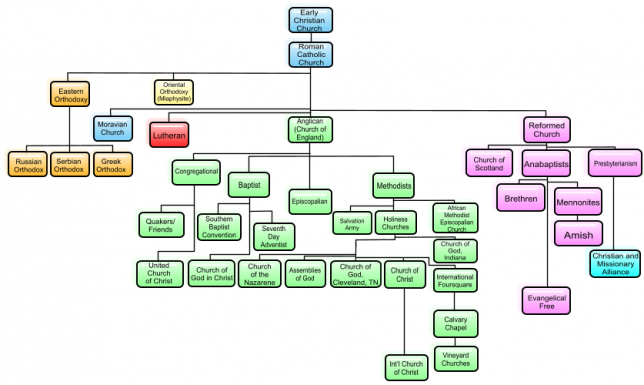 In terms of “Christian denominations”, there are Catholics, Lutherans, Anglicans, Calvinists, Presbyterians, Methodists, Wesleyan’s, Baptists, Pentecostals, Quakers, Amish, Mennonites, Seventh Day Adventists, Unitarians, Church of God, Church of Christ, Church of Latter Day Saints, and dozens if not hundreds more “Christian denominations”. Even worse, across the broad array of “Christian denominations”, there are frequently many sub-denominations under each denomination. Under the Baptist umbrella for example, there are Primitive Baptists, Southern Baptists, Zionist Baptists, General Baptists, Free Will Baptists, Reformed Baptists, Independent Baptists, Missionary Baptists, Progressive Baptists, Landmark Baptists, and many, many more. Coming closer to home, under the Pentecostal umbrella there are Holiness Pentecostals, Charismatic Pentecostals, Oneness Pentecostals, and several others besides. Altogether, this adds up to division, weakness, confusion, and failure in the realm of Christianity…and this is NOT of God. Sadly, regrettably, to our shame, to our reproach, and ultimately to our condemnation, people who call themselves Christians are extremely divided. It should be the case that people who call themselves Christians believe nearly identically. But of course, they do not. In fact, across the spectrum of “Christianity”, so-called Christian people can believe more differently than they believe alike. God’s truth is perverted by carnal people. God’s “unity of the Spirit” is divided by carnal people who change the overall truth of God into a narrowly-focused distortion or perversion. To illustrate, there are certain “Christian denominations” that teach a “vegetarian” doctrine and condemn eating meat. And, what does the Bible say about this? Now, if a person chooses to be a vegetarian, that is their personal choice and I do not know of anything in the Bible that forbids or condemns that. But, to turn it into a fundamental ordinance that a church or denomination revolves around IS a “doctrine of devils”. “Christian denominations” with misguided doctrines…or flat-out-wrong doctrines…or even doctrines of devils…are what happen when carnal people zoom in on a single verse or sub-section of scripture…and elevate it to being more important than everything else that is in the Bible. As an example, there is a “Christian denomination” that has zoomed in on Hebrews 13:15 which says, “By him therefore let us offer the sacrifice of praise to God continually, that is, the fruit of our lips giving thanks to his name.” and they have misconstrued this verse and turned it into a denomination and a doctrine that insists there should be no musical instruments in a church service. Never mind that Exodus 15, Job 21, 30, Psalms 33, 45, 92, 144, 149, 150, Isaiah 38, and Habakkuk 3 all explicitly, directly, and plainly mention praising God with musical instruments. Bizarrely, most members of this particular denomination that I have been around think there is nothing wrong with listening to worldly music (lyrics and instruments) outside of church…they see nothing wrong with going to a dance on Friday or Saturday night and dancing lasciviously to non-Christian, lewd, vile, corrupt, perverted, sinful music. In other words, as long as they don’t play instruments in the church…as long as they only sing “A Capella” in church…then they are okay…and there is nothing wrong with them listening to worldly music outside of church that promotes, uplifts, and glamorizes what the Bible forbids and condemns. Perhaps this is why such “Christian denominations” succeed, thrive, and grow so large…it is much easier for our carnal nature to do without musical instruments in a church service than it is to actually live according to the commandments and standards given to us across the entirety of the Bible. What I am talking about here is in fact the snare of any and every “denomination” that emphasizes a few PET doctrines. That is, many people are falsely assured of “salvation” and “heaven” if they will just abide by a few key doctrines prescribed by their denomination. In fact, people within a given denomination typically hear so much about their denomination’s PET doctrines that they have little knowledge of anything else contained within the Bible. I am reminded of a case where an unwed teenage girl turned up pregnant. When her parents and the people in her church found out about it, there was of course a big commotion over it and a corresponding confrontation of the involved parties. But, the amazing thing that came out of the confrontation was the fact that the girl did not understand why her parents and church people were so upset because she had not violated any of the church’s doctrines. In other words, the girl had grown up in a church where she had heard her church’s PET doctrines OVER AND OVER…but she had NEVER heard that fornication was a sin. In her mind, as long as she abode by the PET doctrines of her family and church, then she was “saved” and anything else she wanted to do was okay. While this is perhaps an extreme example, it is a great illustration of how “Biblically-retarded” so many people who call themselves Christians really are. That is, too many so-called Christians know a lot about their church’s PET doctrines…and they know very little about what God actually says to them in the Bible. And, not knowing what the Bible says in its entirety is a serious problem because it means a person CAN be misled, deceived, and ultimately destroyed…which is of course satan’s primary objective. So, does this mean we should all go hang ourselves? Of course not! Such a “doctrine” is completely nonsensical. And, while it is obvious that this made up illustration is bogus, it provides a glimpse into just how convincing, authoritative, and truthful misconstrued scriptures can be made to sound. In Matthew 4 and in Luke 4, we read how satan came to Jesus and referenced Bible verses in connection with normal human (i.e. carnal) needs, interests, and desires to try to get Jesus to sin and to go astray from God’s true and right way. This is EXACTLY how satan deceives and destroys so many people. He recognizes their carnal needs, interests, and desires. He sees their strong self-focus and their lack of God-focus (i.e. their lack of spiritual-mindedness). So, he connects misconstrued, misinterpreted, out-of-context scriptures to their carnality…and presents these scriptures as if they are God’s word…God’s promises…God’s truths…God’s answers…and God’s will. And, the satanic offer sounds so good to these people. What satan is offering is what they want. Plus, satan’s offer has a Bible-reference backing it…so it has to be of God, right? Well, this is how carnality is twisted into something that is CALLED “righteousness”. This is how that which is NOT of God becomes “religion”. This is how people are deceived and led astray to their own spiritual destruction. The point is this: the main way you and I can avoid being deceived by satan and those who are under his influence is by knowing the entire Bible…from front to back…Old Testament and New Testament…so that when satan comes whispering in our ear…or when satan’s ministers come presenting their doctrines to us…we have the ability to discern between what is the truth of God and what is a lie from the devil. Bottom line, avoid deception…avoid being led astray into sin…by knowing what the Bible says in its entirety. By knowing all of God’s Word that He has given to us in the Bible (both Old Testament and New Testament), we will know what God’s truth is…and what is not God’s truth. Recognize that all “Christian denominations” that emphasize a few verses in the Bible…while ignoring, minimizing, denying, or rejecting other important verses in the Bible…are “Christian denominations” that are at best teaching and preaching a subset of God’s truth…and at worst are teaching and preaching FALSE doctrines! Fellow life-traveler, God reveals the “unity of the faith” to us in the Bible. There is singularity in God’s truth and God’s way through Jesus Christ. Plurality of truth is not of God. And, our soul’s eternal abode (Heaven or Hell) depends upon us moving into the true Christianity that God instructed us to live in. So, if you are presently in a church or denomination that is zoomed in on a narrow set of emphasized scriptures…if you are presently in a church that is very dogmatic about a few PET doctrines…then I encourage you to begin reading the entirety of the Bible…and to begin praying that God lead you to a different church that lives MORE of His truth.